* Deforestation has been trending upward in the Tanintharyi region of southern Myanmar, with the area losing 6 percent of its tree cover in 14 years. Mines and new roads are among the threats to its forest. * A committee formed by a community in Tanintharyi is working to preserve the remaining forest of the Kamoethway river valley. * The organization – Rays of Kamoethway Indigenous People and Nature – has established nine different conservation zones in the region. * But members say another conservation project established by Myanmar's government and funded by oil and gas companies is threatening the community and its conservation efforts. The road was designed by private company Italian-Thai Development PCL and supported by Myanmar’s old military regime. Construction stopped in 2013 after Italian-Thai Development fell into financial difficulty. All that remains of the two-lane highway is a muddy scar, severing Kalaikyi and the Kamoethway river valley. However, the new government has just reaffirmed its commitment to the Dawei Special Economic Zone and, with funding from Japan, road construction is expected to continue. Other development projects have followed in their footsteps. In 2012, mining company UMG entered the valley and began exploration for minerals before being evicted by the community. “Once we were afraid of bullets, now we are afraid of outsiders destroying our natural resources and cultural heritage,” U Ye Aung said. Under constant threat of land grabs and eviction, the Kamoethway community formed a village committee dedicated to environmental conservation. This organization, Rays of Kamoethway Indigenous People and Nature (RKIPN), has now become a leading example of community-based conservation in Myanmar. They say their success proves that indigenous people can effectively manage their own natural resources without government or foreign intervention. “We started the RKIPN because we did not want our natural resources – our land, water and forests – to be lost or destroyed by these outside forces who kept coming onto our land,” said RKIPN chairman U Saw Kho. Using its members’ local knowledge of the surrounding environment, RKIPN has established nine different conservation zones in the Kamoethway river valley, including a wildlife sanctuary, fish conservation zone and watershed zone. Each zone has its own rules and regulations that are policed and enforced by the community. RKIPN is also conducting detailed surveys of the flora and fauna in their territory with help from a local civil society organization called TRIP NET. A fish diversity survey found 86 different species including three previously unknown species that are awaiting official classification. Using this evidence, the RKIPN have been able to fend off multiple mining projects that would have threatened the local ecosystem. Other communities in Tanintharyi Region, the southernmost state of Myanmar, have endured a much longer struggle against these proposals. Earlier this year, two tin mines were suspended by the local government for failing to follow the Mining Law and causing environmental damage. The Heinda and Bawapin mines had long been opposed by surrounding communities, which accused the companies of polluting water supplies and ruining farmland. Myanmar had around 43 million hectares of tree cover in 2000, according to data from the University of Maryland and visualized on the monitoring platform Global Forest Watch. However, between 2001 and 2014, more than 2 million hectares were lost – mostly to agriculture, logging and other human activities. In other words, Myanmar lost nearly 5 percent of its tree cover in 14 years. Tanintharyi’s forest loss was even greater, with the region losing more than 6 percent of its tree cover over that same time period. Nevertheless, Myanmar’s forests are some of the most extensive and intact in mainland Southeast Asia, with several areas of particularly continuous and undisturbed primary forest called Intact Forest Landscapes remaining today. The southern forests of Tanintharyi Region have been identified as high priority by the Myanmar government. They consist of mature forest formations, with evergreen dipterocarp forest on higher ground and semi-evergreen in lower areas. The region supports resident populations of several threatened species including Asian elephants (Elephas maximus), Asian tapirs (Acrocodia indica) and plain-pouched hornbills (Rhyticeros subruficollis). There have also been occasional signs of Indochinese tigers (Panthera tigris corbetti), but its status in the region is unclear. Tanintharyi is Myanmar’s southernmost province, and still contains Intact Forest Landscapes (IFLs), as well as large swaths of mangroves. However, many of these IFLs have been degraded since 2000 and deforestation appears to be increasing, with more tree cover lost in 2014 than in any other year since measuringbegan in 2001. 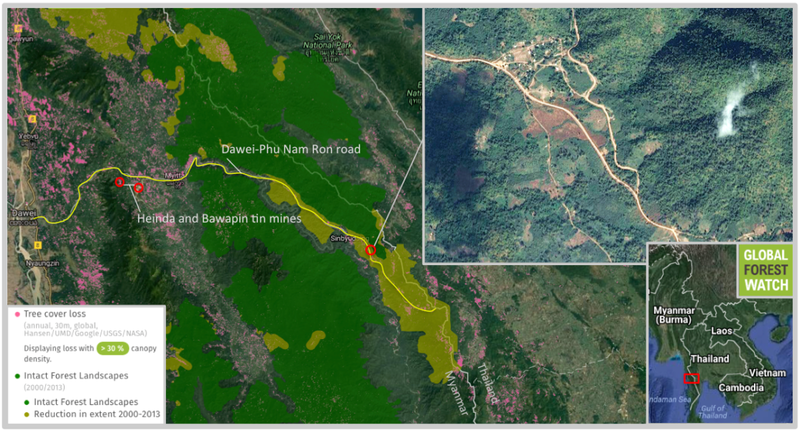 The road from Dawei to the Thai border cuts through a large IFL that occupies the Kamoethway river valley, with satellite data and imagery showing secondary roads and other development radiating outwards into forest that was undisturbed as of 2000. After a construction stall in 2013, Myanmar’s government is pressing forward with the project. The latest threat to the Kamoethway river valley comes from other conservationists rather than extractive industries, say RKIPN representatives. The Tanintharyi Nature Reserve Project (TNRP) is a 420,000-acre conservation zone. It was established by the Myanmar government but funded by the oil and gas companies Total and Pentronas as part of their corporate social responsibility program for the controversial Yadana gas pipeline. The project is designed to contribute to the conservation of Myanmar’s biodiversity while compensating for some of the impacts on biodiversity caused by the pipeline and support facilities. The project will continue for the lifetime of the gas pipeline, which currently is expected to last at least until 2028. Although founded in 2005, the TNRP could not be established until the ethnic conflict drew to a close in 2012. The forest department has only recently entered the Tanintharyi hills to demarcate the protected area, which overlaps with customary land managed by the indigenous Karen people living in the Kamoethway river valley. This has raised concerns among RKIPN members that they will lose control of their forests to an outside organization with a theoretical rather than practical understanding of local ecosystems. The organization employs traditional Karen techniques to protect the flora and fauna on its land. Because of this history of conservation, RKIPN believes it is best able to protect the region’s natural resources. “The wildlife in Tanintharyi was safe long before we started our conservation project because the Karen were the only people using the forest….the Karen are known for the strong bond to nature and our ancestors taught us to conserve the nature upon which we depend” U Saw Kho told Mongabay. With the exception of the wildlife sanctuary where humans are prohibited from harming any species, villagers can kill animals that are found on their land as long as it is not done for commercial purposes. However, using their own knowledge of local animal populations, the community has created a list of restricted species that cannot be hunted under any circumstance. 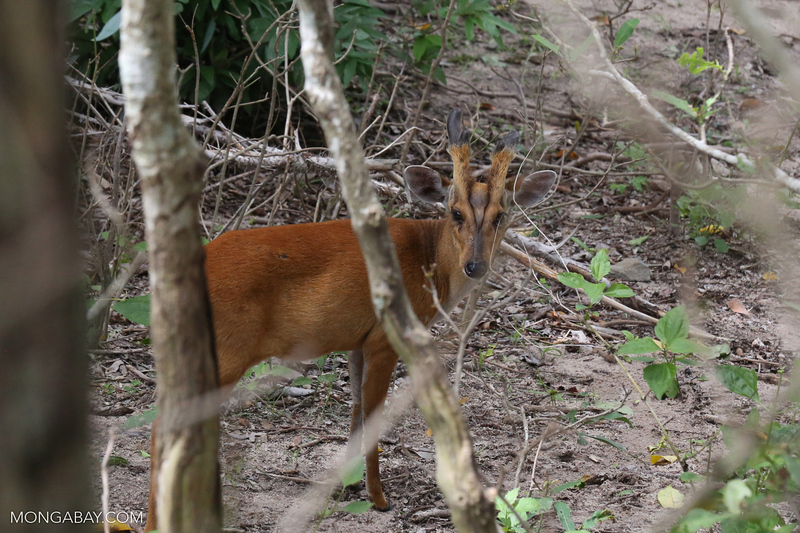 This includes almost all mammal species that are completely protected under the Protection of Wildlife and Conservation of Protected Areas Law (1994) as well as other species that do not have full protection according to Myanmar law, like the barking deer. RKIPN has also protected certain indigenous cultural practices that are rarely recognized by the government or outside conservation projects. The smallest of their nine conservation zones is an umbilical chord forest, where parents bury the umbilical chord of their newborn child in a traditional Karen ceremony that is believed to bring good health. RKIPN’s greatest concern with the TRNP is that it may threaten the livelihoods of Kamoethway villages that have lived off the forest for over 1,000 years. Recognizing that environmental conservation must be integrated with securing sustainable livelihoods, members of RKIPN conducted a socioeconomic survey of the Kamoethway river valley. 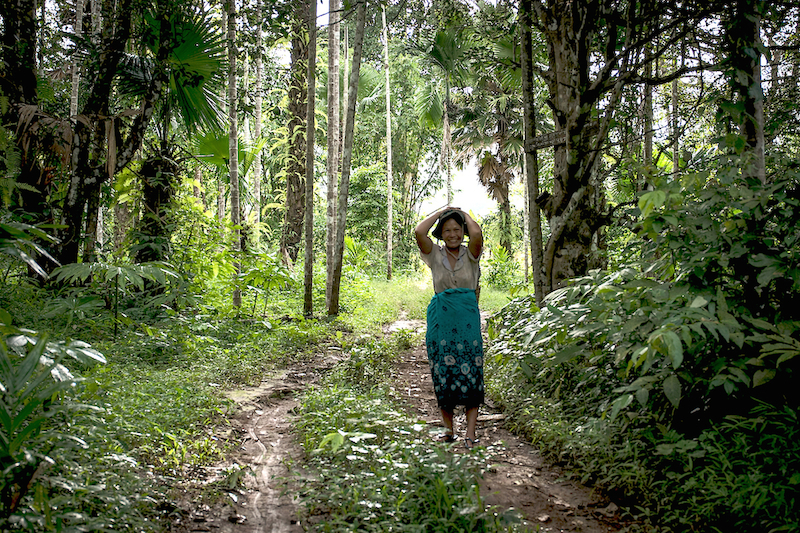 It found that 28 percent of the villagers’ cash and non-cash incomes come directly from the forest, with betel nut farms providing the largest source of income. Under no circumstance may villagers in the Kamoethway river valley commercially fell timber. However, RKIPN has established a utilization forest where the indigenous population can obtain construction materials, firewood, food and herbal medicine. There is also an agro-forestry zone that permits the integration of planted food crops according to the local forest type. “We have to be able to go into the forest freely so that we can protect our livelihoods, we will not be prohibited from our forest” U Saw Kho said. The RKIPN territory is not officially recognized by the local government. However, through affective management of this area the organization hopes to boost its bargaining power with the authorities. Under the 1995 Community Forest Instruction amendment, forest user groups can apply to their district forestry department for permission to establish a community forest. Since this instruction was added to the Forest Law, an average of 7,000 acres of community forest has been established in Myanmar each year. In total, 42,000 acres of forest are protected under the RKIPN’s nine conservation zones. Franktheera Abreu says the district forestry department supports their local conservation project. However when approached, neither the district forestry or conservation departments were available for comment as they claimed not to know about the RKIPN. The TNRP includes a community development program that aims to improve the livelihoods of local villagers though community forest activities. There are 12,000 people, from 29 different villages, living within the reserve boundaries. So far, the TNRP’s managers have established 17 community forests where these villagers can fell timber for personal use, extract forest products and practice agro-forestry. The community forests range in size from 300 to 5,000 acres and act as a buffer zone for the core protected area, which villagers are not allowed to use. The district forest departments are helping villagers manage their community forests by providing cash crop seedlings and fruit trees. “The local communit[ies] do not earn much money and rely on these forests and fruit trees for most of their income….we do not want to damage that livelihood,” said the TNRP park warden U Hla Myo Aung. Nevertheless, villagers from the RKIPN do not intend on participating in the project. In two years, RKIPN has attracted more than 100 members who represent all 12 villages in the Kamoethway river valley. All members are part of a working group that takes direct responsibility for a particular zone of the forest. Using the community-based research as a control, these groups continually monitor the forest and its flora and fauna. “This is a community-run project that benefits the whole community. Therefore, it will get passed from generation [to] generation,” U Saw Kho said. While not aware of RKIPN specifically, TNRP park warden U Hla Myo Aung does admit that there have been problems with community participation along the southern boundary of the TNRP, near the Kamoethway river valley. “This is a political issue rather than an issue with conservation,” he said. “The problem here is that some Karen people are coming back from Thailand [since the ceasefire] and settling in the southern part of the TNRP. They do not have any rights over the land but complain to the local community and CSOs [civil society organizations], occupy the land and make it hard of us to enter….it is a political issue that needs to be solved at the highest level” U Hla Myo Aung told Mongabay. Other indigenous groups in Tanintharyi Region have been inspired by RKIPN and are beginning to assert control over their own natural resources. Earlier this month, 17 villagers from the Myeik region visited Kamoethway to observe their techniques. Their ancestral lands fall within the boundaries of another government-run conservation zone, the Tanintharyi Nature Park (TNP). RKIPN does not have any outside backers other than the locally based civil society organization, TRIP NET. However, there is a growing international pressure for conservation groups to respect the rights of indigenous people. Earlier this month, UN special rapporteur Victoria Tauli-Corpuz told delegates at the International Union for Conservation of Nature World Conservation Congress in Honolulu that “projects supported by major conservation organizations continue to displace local peoples from their ancestral homes.” She specifically named the World Wildlife Fund, Conservation International and the Wildlife Conservation Society (WCS) as guilty partners. The latter worked closely with the government as technical advisors on the development and implementation of the TNRP. “WCS believes that effective and sustainable conservation can only happen with the close engagement of the local civil society,” Rama Wong, WCS regional advisor, told Mongabay. “Communities living inside and near protected areas are our most precious resource for protecting wildlife resources… For this reason, WCS invests heavily on empowering the capacity of local communities to take ownership and manage their natural resources. “WCS acts as a bridge between local communities and the government… While local communities know us and know what we do, external foreign observers may misinterpret our work because of our role and position of proximity with government institutions.” WCS also said that they are working with the RKIPN on certain activities. But members of RKIPN say they do not necessarily need outside support to continue their conservation efforts. Article published by Morgan Erickson-Davis on 23-09-2016.